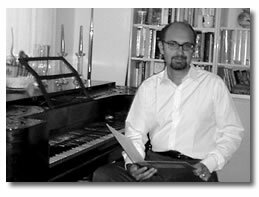 The Roman pianist and musicologist Costantino Mastroprimiano is an acknowledged expert in Clementi. says the head of the Milan foundation Arcadia, that supports Mastrorpimiano’s Clementi project: registration of the complete Sonatas for fortepiano on original instruments. He is editor and member of the scientific committee for Muzio Clementi’s complete work for the music publishing company Ut Orpheus, Bologna. As a soloist and chamber music musician he has played in all Italian mayor cities, in Austria (Brahms-Saal Wiener Musikverein), in France in Bulgaria, Slovenia, Germany. He per-formed Mozart’s complete chamber music work. As a world première he played at the San Gimignano Festival J. S. Bach’s Goldberg-Variationen together with the 14 canons BWV 1089 on the fortepiano. Besides his artistic and scientific work he is professor for chamber music at Perugia’s Conservatory. Mastroprimiano is founder and member of “Concert sans Orchestre” - with Fiorella Andriani, flute, Liana Mosca, violin, Marco Testori, violoncello - an ensemble devoting itself on chamber music repertoire and on authorial transcriptions on original instruments. 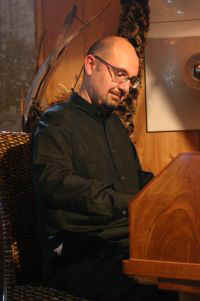 Costantino Mastroprimiano holds a Foggia Conservatory and Siena Accademy Chigiana diploma in piano and chamber music, both with distinction. 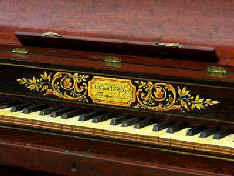 At the age of fourteen Clementi arrived in the UK, where his musical edcation was guaranteed by a sponsor. In 1773 his first sonatas were published, four years later he became a cembalist of the London Italian opera. In 1781 he began travelling to Paris, Strassburg and Vienna, where he passed very well a competition with Mozart. Other travels up to St. Petersburg followed. In London he worked as a soloist, concductor and professor. He also became partner of a music publiher’s house and the fortepiano factory Longman & Broderip. In spring 1807 Clementi met Beethoven in Vienna and published some of his works. Sources let us know undoubtfully that Beethoven had great respect for Clementi. In his small musical libary nearly all sonatas by Clementi could be found. According to his secretary Schindler he classified them as “the most beautiful and the most pianistic of all compositions”. Clementi helds a very important position in the history of fortepiano music. On the contrary to Mozart, Beethoven respected him very well and owes him a lot. As a pianist Clementi conctributed much to the way how playing the fortepiano with more sound, as a composer he developed the sonata’s. form. His most important work are 106 sonatas for fortepiano, Gradus and Parnassum still studied today, one piano concert, chamber music and six sinfonies. Costantino Mastroprimiano’s idea is to record Muzio Clementi’s entire work for fortepiano on original instruments. As for the played instruments as for the musical sources, the recording will be a wold wide premiere. The complete work will be recorded on 16 CDs, using original instruments belonging to important European collections – like the Accardi van Bussel collection or Finchcooks – and instruments of historical importance will be played. As well The instruments will be choosen according to the chronology of the compositions. The musical sources will be original sources, for example the first Viennese editions or recently found sources in London. As well the instruments will be choosen according to the chronology of the compositions. Thanks to the initiative of the Italian fortepiano player Costantino Mastroprimiano the project was brought into being. Mastroprimiano is one of the editors of Clementi’s entire work for Ut Orpheus publishers, Bologna, in Italy and abroad since ten years he dedicates his work to Clementi. The project is realized thanks to the label Brillant Classics, one of the most important music houses worldwide, and thanks to the Milan foundation Arcadia. The artist has all the Clementi-Sonatas in his repertory and can combine them with other composers like Mozart or Beethoven. The final programmation will be done on arrangement and knowledge about instrument and concert place.